Interview: TIM MOORE Tim Moore is the managing director of A.G.T (Administration of Gambling on Track) in this brace of interviews he explains the AGT’s history, their work and his thoughts on how the betting ring can embrace the 21st Century. Tim Moore – managing director of the A.G.T. (Administration of Gambling on Tracks) talks about the history of the AGT rising from the ashes of the N.J.P.C. (National Joint Pitch Council). Turning around the initial resentment of bookmakers. His background with Ladbrokes prior to his current role. The history of the pitch rules and the end of the ‘Ferguson Agreement’. He explains the role of the B.R.M (Betting Ring Manager) and what qualifications are require to become one. Tim also gives a few tips to novice racegoers so they can avoid a dispute when betting with racecourse bookies. Despite being rare, he runs through the common problems dealt with by the AGT staff. Tim Moore – of the A.G.T. Administration of Gambling on Tracks continues his advice to novice punters, looking for value, being careful when placing your bets, checking your tickets etc. Tim gives some of his ideas of how bookmakers can ‘up their game’ to compete in the modern day. The rarity of a dispute being someone actually ‘trying it on’. He champions the honesty and integrity of racecourse bookmakers and explains ‘elephant thumb’ bets that punters tried to claim. 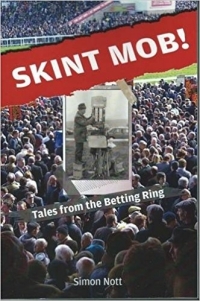 He also talks the role of the BRM in making sure that bookmakers aren’t flouting the rules. He also explains his ideas for bookmakers moving forward through the 21st century and technology.